Strava finally offers native app for Apple Watch – are we closer to the perfect run tracker? It's finally here: a way for runners to leave their iPhone behind and still be able to upload their run to Strava at the finish. 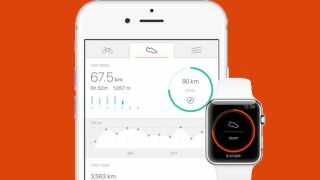 Strava, one of the most popular running platforms around, has ironically been dragging its feet over launching a native app for the Apple Watch 2 that can use the device's inbuilt GPS – but I've been exclusively tipped by Strava that it's finally on the App Store. It brings us another step closer to Apple creating the world's best running watch in the future – something I posited two years ago with the launch of the original Watch from the Cupertino brand. There's not a lot to say about the appearance of the new Strava app for the Apple Watch, as it'll basically just do the same job that it does now (tracking time, pace, distance, speed and heart rate) but without the need for a phone welded to your arm the entire time. But it shows there's an appetite among fitness app makers to develop apps that can run on the smart watch, untethered from the phone (Strava has recently announced a similar app for Android Wear), and these efforts could push the dedicated running watch into the realm of the super high-spec and high-cost device, for only the most obsessed of athletes. As I've said before: people don't want a singular device that does one thing well any more, they want one that does a lot of things well enough. The smartphone is better than the in-car GPS, camera, calculator, torch and gaming device, despite being far poorer than each of those devices at their dedicated function. The reason that neither the Apple Watch nor any other device hasn't taken off as one of the world's best workout trackers is simple: none fulfil the criteria of being good enough yet. If I've got to track a recovery run, interval session, tempo run and endurance training in the next few days, I want a watch / app that can set up all the phases for me, ping me when I need to change speed, and track all the key metrics (and upload it to my favorite running platform at the end). The Samsung Gear S3, Apple Watch 2, LG Watch Sport and NewBalance RunIQ (to name a few smartwatches with fitness at their center) can almost do that for me, but not accurately enough. So I stick with something from the more dedicated brands – Garmin, TomTom or Polar – to make sure my crucial data is as trustworthy as possible. In my tests with the best smartwatches around, they've all been okay for fitness tracking, but nothing stellar. The Samsung Gear S3 has an odd habit of adding an extra mile to your run suddenly, and has a poor heart rate monitor (and we're still waiting for a Strava app for this platform). The Apple Watch Series 2 is pretty good, but the data is locked in and very basic. The Nike+ app and Watch 2 variant improved this by adding the ability to pull that data out, but the quality of that data was too poor to trust. And the less said about the NewBalance model, the better. I'm currently testing this watch, which is supposed to be the Strava-powered running smartwatch around, and it's just unable to find GPS, hold GPS, read my heart rate or do anything vaguely trustworthy over any distance. Compare that with a run-of-the-mill Garmin or TomTom device that costs a third of the price of the smartwatch brigade yet still provides more quality data at the end right to your favourite running platform, and you can see that the smartwatch still has a long way to go to become attractive to the hobbyist runner or cyclist. These smartwatches also last a day or two at best before needing a charge, where the top models from the dedicated fitness brands are efficient enough to last up to a week on a single juicing. That's a big difference for someone considering which tech to add into their life. The only thing that's missing is decent hardware – and that's going to come to the smartwatch. The GPS chips, heart rate monitors and accelerometers that power the high-end running watches today are going to one day fit into the smartwatch, and while I don't think we'll ever see a smartwatch with a week-long battery life from Apple or Samsung, three to four days is possible. When you've got a device that's got all this hardware on board, everything starts to spiral upwards. App developers make use of those sensors to give you a watch that can provide you with daily notifications, track your weight reps, log your runs and remember your shopping list for you. And that entices more casual runners to buy one – runners who are unwilling to pay a fortune for a watch that only does one thing, but fine with paying out for something that services a lot of needs at once, while tracking all they need it to when it's time for training. And when you see more users, developers are enticed to make more apps, and the interest swells. Which is why Apple, the maker of the most popular platforms for app developers and the world's most popular smartwatch, is in pole position to make the world's best running watch... the one that's on your wrist when you want to go running. There will always be a place for the high-end equipment, as we've got advances in body temperature tracking, more precise GPS and heart rate monitoring, blood oxygen monitoring and gyroscopes to come – all of which will give you more accurate data. But the smartwatch's biggest problem is locked-in and poorer-quality data – and with Strava finally appearing on the Apple Watch, we're nearing the finish line of that problem being solved. Gareth Beavis is TechRadar's Running Man of Tech, testing the latest in fitness technology in a never-ending quest to run further and faster and bringing you the results in a weekly column.